"The miracle of the appropriateness of the language of mathematics for the formulation of the laws of physics is a wonderful gift which we neither understand nor deserve." Alan Shusterman (Reed College) "Spartan tip"
Dani Setiawan (SMU), "Advance Natural Bond Orbital (NBO) Analysis""
Schrödinger's Kitten "How to install NBO on Mac OS X Yosemite"
NBO 7.0. E. D. Glendening, J, K. Badenhoop, A. E. Reed, J. E. Carpenter, J. A. Bohmann, C. M. Morales, P. Karafiloglou, C. R. Landis, and F. Weinhold, Theoretical Chemistry Institute, University of Wisconsin, Madison (2018). E. D. Glendening, C. R. Landis, and F. Weinhold, "NBO 7.0: New Vistas in Localized and Delocalized Chemical Bonding Theory," J. Comput. Chem. (submitted). L. Suidan, J. K. Badenhoop, E. D. Glendening, and F. Weinhold, "Common Textbook and Teaching Misrepresentations of Lewis Structures," J. Chem. Educ. 72, 583-586 (1995). F. Weinhold, "Chemical Bonding as a Superposition Phenomenon," J. Chem. Educ. 76, 1141-1146 (1999). F. Weinhold and C. R. Landis, "Natural Bond Orbitals and Extensions of Localized Bonding Concepts", Chem. Educ. Res. Pract. 2, 91-104 (2001). F. Weinhold and R. A. Klein, "What is a Hydrogen Bond? Resonance Covalency in the Supramolecular Domain", Chem. Educ. Res. Pract. 15, 276-285 (2014). A. D. Clauss, S. F. Nelsen, M. Ayoub, J. W. Moore, C. R. Landis, and F. Weinhold, "Rabbit Ears Hybrids, VSEPR Sterics, and Other Orbital Anachronisms", Chem. Educ. Res. Pract., 15, 417-434 (2014). C. R. Landis and F. Weinhold, "The NBO View of Chemical Bonding", in, G. Frenking and S. Shaik (eds. ), The Chemical Bond: Fundamental Aspects of Chemical Bonding (Wiley, 2014), pp. 91-120. F. Weinhold, C. R. Landis, and E. D. Glendening, "What is NBO Analysis and How is it Useful?" Int. Rev. Phys. Chem. 35, 399-440 (2016). F. Weinhold, "Natural Bond Orbital Analysis: A Critical Overview of its Relationship to Alternative Bonding Perspectives," J. Comp. Chem. 33, 2363-2379 (2012). F. Weinhold, "Natural Bond Critical Point Analysis: Quantitative Relationships between NBO-based and QTAIM-based Topological Descriptors of Chemical Bonding," J. Comput. Chem. 33, 2440-2449 (2012). F. Weinhold, P. v.R. Schleyer, and W. C. McKee, "Bay-Type H...H 'Bonding' in Cis-2-Butene and Related Species: QTAIM vs. NBO Description," J. Comput. Chem. 35, 1499-1508 (2014). F. Weinhold and E. D. Glendening, "Comment on 'Natural Bond Orbitals and the Nature of the Hydrogen Bond'" J. Phys. Chem. A 122, 724-732 (2018). F. Weinhold, "Rebuttal to the Bickelhaupt-Baerends Case for Steric Repulsion Causing the Staggered Conformation of Ethane", Angew. Chem. Intern. Ed. 35, 4188-4194 (2003). C. R. Landis, R. P. Hughes, and F. Weinhold, "Bonding Analysis of TM(cAAC)2 (TM = Cu, Ag, Au) and the Importance of Reference State," Organometall. 34, 3442-3449 (2015). D. Nori-Shargh and F. Weinhold, "Natural Bond Orbital Theory of Pseudo Jahn-Teller Effects," J. Phys. Chem. A 122, 4490-4498 (2018). J. P. Foster and F. Weinhold, "Natural Hybrid Orbitals," J. Am. Chem. Soc. 102, 7211-7218 (1980). A. E. Reed, R. B. Weinstock, and F. Weinhold, "Natural Population Analysis," J. Chem. Phys. 83, 735-746 (1985). A. E. Reed and F. Weinhold, "Natural Localized Molecular Orbitals," J. Chem. Phys. 83, 1736-1740 (1985). E. D. Glendening, S. J. Wright, and F. Weinhold, "Efficient Optimization of Natural Resonance Theory Weightings and Bond Orders by Gram-Based Convex Programming," J. Comput. Chem. (submitted). E. D. Glendening, C. R. Landis, and F. Weinhold, "Resonance Theory Reboot," J. Am. Chem. Soc. (ASAP, DOI: 10.1021/jacs.8b12336)..
K. Kyriakidou, P. Karafiloglou, E. D. Glendening, and F. Weinhold, "To Be or Not to Be: Demystifying the 2nd-Quantized Picture of Complex Electronic Configuration Patterns in Chemistry with Natural Poly-Electron Population Analysis," J. Comput. Chem. 40, 1509-1520 (2019). E. D. Glendening and F. Weinhold, "Efficient Evaluation of Poly-Electron Populations in Natural Bond Orbital Analysis," Chem. Phys. Lett. 711, 23-26 (2018). F. Weinhold, "Natural Bond Orbital Methods," in, Encyclopedia of Computational Chemistry, P. v.R. Schleyer, N. L. Allinger, T. Clark, J. Gasteiger, P. A. Kollman, H. F. Schaefer III, P. R. Schreiner (Eds. ), (John Wiley & Sons, Chichester, UK, 1998), Vol. 3, pp. 1792-1811. E. D. Glendening, C. R. Landis, and F. Weinhold, "Natural Bond Orbital Methods," WIREs Comput. Mol. Sci. 2, 1-42 (2012). F. Weinhold, "Natural Bond Orbital Analysis of Photochemical Excitation, with Illustrative Applications to Vinoxy Radical," in, A. G. Kutateladze (ed. ), Computational Methods in Organic Photochemistry: Molecular and Supramolecular Photochemistry (Taylor & Francis/CRC Press, Boca Raton FL, 2005), pp. 393-476. 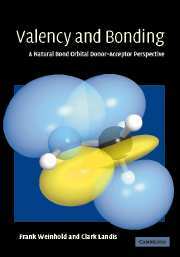 F. Weinhold and C. R. Landis, Valency and Bonding: A Natural Bond Orbital Donor-Acceptor Perspective (Cambridge University Press, 2005), 760pp. F. Weinhold and C. R. Landis, Discovering Chemistry with Natural Bond Orbitals (Wiley-VCH, Hoboken NJ, 2012), 319pp.